In the 1970s Nancy Ann Tappe developed a concept of Indigo children, which referred to children who were believed to possess special, unusual, and sometimes supernatural traits or abilities. The concept of Indigo children later gained popular interest with the publication of a series of books in the late 1990s and the release of several films in the following decade. Since then a number of phrases have been coined to refer to such gifted children such as Crystal children, Rainbow children, Star children, Psychic children, etc. SSRF and the Maharshi University of Spirituality too, over the years has observed such extraordinary children (albeit from a purely spiritual viewpoint) who are being born in current times and who are of a higher spiritual calibre. They are more spiritually evolved (i.e., they have a higher spiritual level) from birth itself. We have coined a term and called them ‘Divine children’. These children are not merely gifted with sixth sense, telepathic ability or clairvoyance. However, through advanced sixth sense, our spiritual research team found that they are born at a high spiritual level and come from the higher positive subtle regions of the Universe. We would like to take this opportunity to share spiritual research conducted on this spiritual phenomenon with the world, the importance of such children and the purpose of their birth in the current turbulent times. In this section, we will also provide case studies about such Divine children over various age-groups and how their behaviour differs to the average child. 2. Who are Divine children (spiritually evolved children)? It is every parent’s dream to have a gifted child; a child who shows a natural and extraordinary talent in worldly disciplines such as learning languages, solving math problems with ease, superior scientific reasoning, learning complex music composition and other various arts. Parents are on the other hand less likely to be pleased with a child who has a gift of a higher level of sixth sense and who makes statements such as, “I see dead people or ghosts”. Most parents do not know how to handle kids making such statements and are less equipped to deal with kids who show an innate understanding of the spiritual dimension. It is also common knowledge that if a child shows extreme devotion for the Divine and wants to devote his or her entire life towards spiritual growth and serving God, their wishes would most likely be met with a lot of resistance from their parents. What most people do not know is that gifted children, who have for example the ability to compose complex musical pieces at a young age, are most likely to be influenced by some entity in the spiritual dimension. The nature of the entity could be positive or negative. In fact, parents should bear in mind that the spiritual dimension is more likely to have a higher impact on their child’s life than just the physical dimension and psychological thinking. When we use the word ‘Divine children’ we do not use the word to exclusively mean gifted children or children who show genius in a certain field. 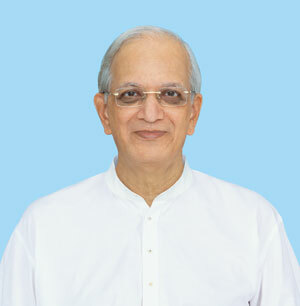 Divine children are mainly determined by their spiritual level. Having said this, Divine children apart from their obvious desire to seek the Divine due to their higher spiritual level, may also show an affinity for a certain discipline and may well excel in it. In the following paragraphs, we examine from a spiritual standpoint, the nature of Divine children and where they come from. In our article on Life after Death and Life Before Birth: The Time Before Conception, we mention the likelihood of which subtle region of the universe (shown above) do people go to after death. Contrary to popular belief, in current times less than 2% of people actually make it to the subtle region of Heaven (Swarga) after death and an even significantly less proportion of people go to the even higher positive regions of the Universe after they die. Most people after they die go to a region known as the Netherworld or Bhuvarlok. If their deeds on Earth are of an evil nature, they can go to one of the seven regions of Hell after death as a punishment. 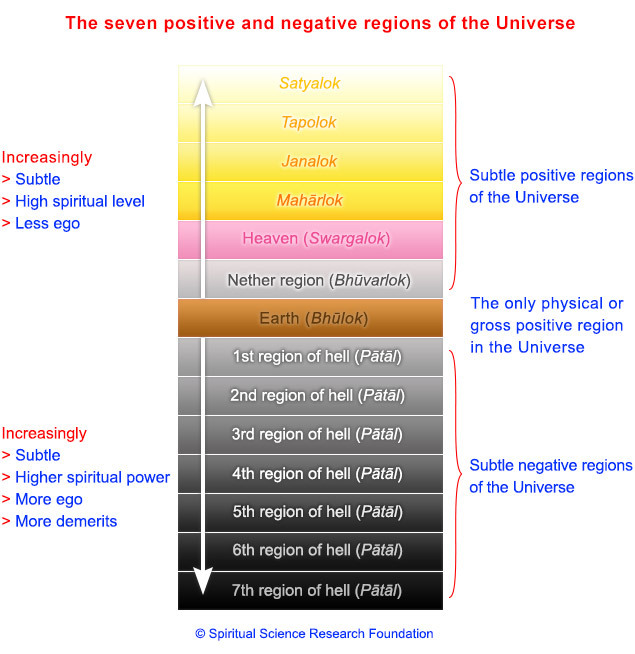 Subtle bodies from the higher positive regions of the Universe (Maharlok and above) do not generally take rebirth on Earth. This is because in these higher planes of existence, one can settle their give and take account as per their destiny in that plane of existence itself. They do not have to be born on Earth to settle their destiny. Even subtle bodies from the subtle region of Heaven are reborn on Earth infrequently. The vast majority of people born on the Earth plane of existence come from the subtle region of the Netherworld (Bhuvarlok). However, every now and again spiritually evolved subtle bodies from the higher regions of the Universe choose to be born on Earth as per some need on Earth. These spiritually evolved subtle bodies when born on Earth are known as ‘Divine children’. In the last few decades we have seen an increase in activity of the birth of such Divine children with higher spiritual levels i.e. above 50%. This means that they, at the time of their birth itself are above the 50% spiritual level due to spiritual practice undertaken in previous lifetimes. We will explore why is this happening and what is contributing to this phenomenon in the upcoming sections. 3. 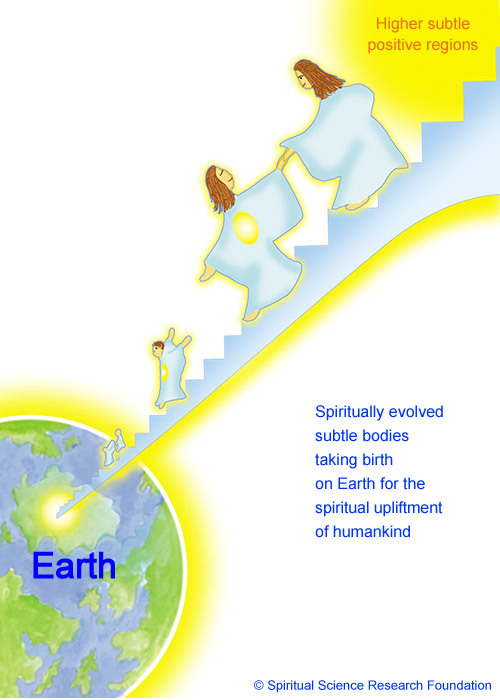 Why are Divine children (spiritually evolved children) being born? As we mentioned earlier, evolved subtle bodies from the higher subtle regions of the Universe can choose the time and place that they are born in order to fulfil some specific mission or spiritual need on the Earth plane. From the years 1999-2023, planet Earth is going through a transition phase in its history. Due to a major subtle battle taking place in the subtle planes of the universe during this period Earth too will be affected. There is also a heightened level of spiritual impurity in the environment all over the world. As part of a cleansing process and an internal rectification process during this period, we will undergo major upheavals including natural disasters and World War 3. After this from the year 2023, we will enter a positive phase in the world’s history known as the Divine Kingdom, which will be an era of spiritual renewal. With approximately half the world’s population being wiped out, the world will understand that our current way of life and current type of leadership actually failed us and got us into this trouble. The Divine children being born in greater numbers today, as they come of age, will help to smoothen this transition and lead the world in the times to come to greater spiritual awareness in all aspects of life and governance. These children in the future will help society to grow spiritually and create a world of stability. 4. How many Divine children are being born? Thousands of Divine children will be needed to run the Divine kingdom. As of Dec 2015, SSRF through advanced sixth sense has identified over 400 such children from all over the world. Up to now they come from two positive subtle regions of the Universe. The following table shows from which subtle region (plane of existence) of the Universe these children have descended from. If the parents of Divine children do not help their kids spiritually or if the Divine children themselves do not focus on spiritual growth, their spiritual level can drop and hence will not be included in the above table. We have been observing and studying the characteristics of children that we have identified as Divine children with the help of their parents. Some of the studies/observations of these children are since the time they were in their mother’s womb and include the positive changes they brought about in their expectant mother’s life. Divine children from the highest regions of the Universe (i.e., Janaloka, Tapoloka, Satyaloka) are rare. Mostly seekers who come from Maharlok are spiritually evolved enough to bring about a positive shift in spiritual consciousness in society. 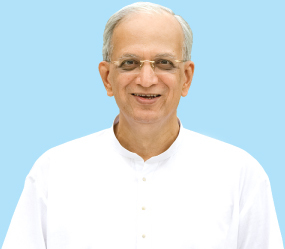 Under the guidance of His Holiness Dr Athavale (apart from the above child seekers) over 700 adult seekers have attained the spiritual level of 60% and above. Another 55 have attained Sainthood, which is the spiritual level of 70% and above. While we have not studied this subset of seekers from birth, it is likely that they would have been Divine children at birth itself. 5. Where and to whom are Divine children being born? Since such Divine children are spiritually evolved they have relatively less give-and-take accounts with others. This means that their destiny and their accumulated account is less. They take birth in families to nullify the remaining 20 to 30% of their give-and-take account, which is remaining with their future family members. We have found that typically such Divine children are more likely to be born to parents who are seekers themselves and who are regularly practicing Spirituality. This is God’s way of ensuring that Divine children have a spiritual upbringing and that they are allowed to pursue their spiritual goals. Accordingly, they are not confined to following the rat race of modern science education that most kids have to adhere to nowadays. 70% of such sāttvik (spiritually pure) children are and will be taking birth in India. The remaining 30% are being born outside of India. This is because of the spiritual purity of India, and that it is India which will lead the world spiritually during the establishment of the Divine Kingdom. Also, we found that as the University of Spirituality and SSRF are tirelessly engaged in helping society make spiritual progress, due to God’s grace we are very fortunate that many such spiritually pure children are taking birth in seekers’ families associated with the organisations. 6. What are the characteristics of Divine children? As seekers desirous of God-realisation have no interest in worldly things, similarly the Divine children who have taken birth from higher positive planes of existence do not have interest in things related to activities of mundane worldly life. They don’t like the environment at school and college, but parents push them to excel in studies. However, when parents realise that they have a strong spiritual bent and their purpose of life is to attain God-realisation, they will be able to assist their children better. Such children can not only progress themselves, but also help others to progress towards God. They usually have a happy and blissful disposition. They have a peaceful nature and they cry less as compared to other children. They have a liking for simple living and prefer sattvik clothes and food. It is important to note that making a decision on physical appearances alone can be deceptive as negative energies can create such positive behaviour too, so as to fool people. When seen through an advanced sixth sense of vision, they exhibit spiritually positive auras. Indigo kids were named after the blue aura which was perceived around them by Nancy Ann Tappe. However, when seen through the subtle dimension, Divine children have different coloured auras. Through spiritual research we have found that this depends on the path of spiritual practice they followed in their previous births. In the case of the Divine children being born in the current era, they are mainly from the path of Bhaktiyoga (Path of Devotion) and hence have a faint blue aura. The spiritual properties of Divine children vary as per the subtle region from which they are born. 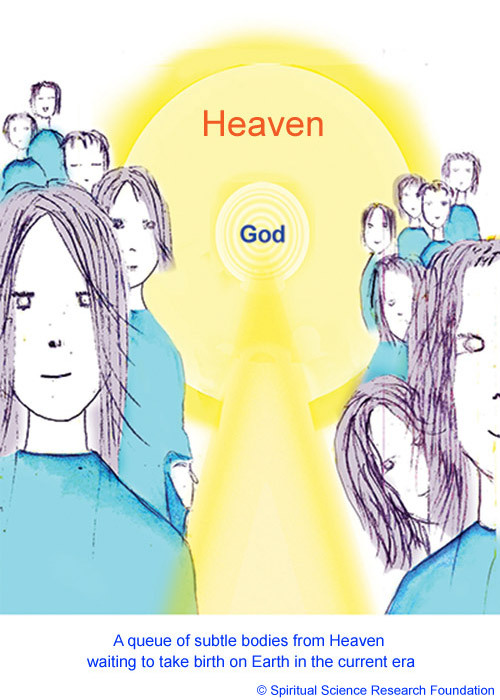 Heaven: Children who are born from the subtle region of Heaven often exhibit artistic qualities. One such example is of Miss Anastasia Vallee (a child seeker from France). From childhood, we saw that butterflies get attracted to her, sit on her hand and stay with her in her room. Maharlok: Children from this subtle region are calmer in their disposition and there is clarity in their speech. They are able to simplify very complex spiritual principles and put them in simple terms for average people to understand. One example is of Purti, a five-year-old girl, who has an advanced sixth sense of vision and is able to speak easily with adults about complex spiritual concepts, understands the importance of the personality defect removal process and also has a lot of desire to spread Spirituality around the world. Highest positive regions: The children who take birth from the highest positive regions such as Janalok, Tapolok and Satyalok (which are beyond Maharlok), are born at a very high spiritual level. Their spiritual characteristics are very subtle in nature and their birth is mainly aligned with God’s mission of taking humanity ahead towards God-realisation. The difference between the children born from various higher positive subtle planes in the universe is explained through the table below. 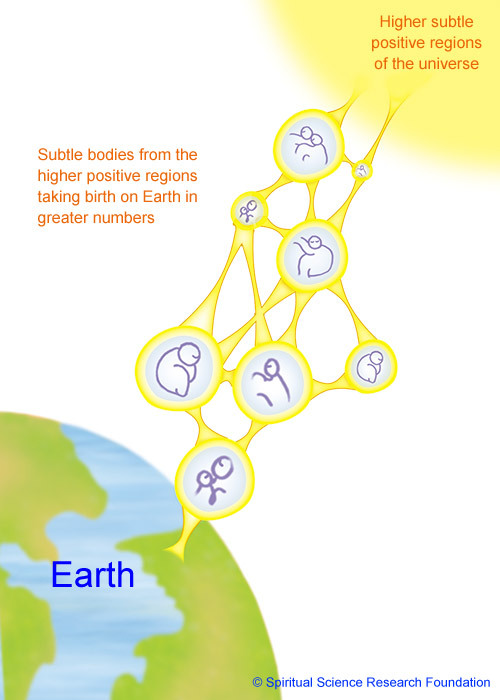 Let’s first look at the reason or mission of a subtle body to take birth on Earth based on the subtle region of the Universe they come from. Subtle bodies from the Netherworld make up almost all of the births on the Earth plane of existence. Such subtle bodies have a combination of sins and merits that they have incurred from their previous births, which have not been reduced due to a lack of spiritual practice. Accordingly, at the time of birth, the intensity and quantity of their give-and-take account is still substantial and significant. As a result, they take birth on the Earth plane of existence to undergo destiny and complete a part of their give-and-take account. If they are curious or wiser they may start spiritual practice. It is important to note that securing a birth in the Earth plane of existence is not easy. Due to some meritorious deeds in their past births, they become eligible to get a human birth. Even so such subtle bodies have more sins and less merits in their accumulated account. As a result, they are likely to be born into adverse circumstances or have problems in life to finish their destiny created from sins. Heaven: They get born again on Earth to overcome their accumulated account. Although they have performed spiritual practice in their past birth, the momentum and desire for spiritual practice has not fully developed. As a result, they take birth to gain momentum in their spiritual practice. They also take birth to accomplish a specific social or spiritual mission such as to participate in the mission of the establishment of Divine Kingdom. Maharlok (the 4th positive region of the Universe): Subtle bodies from this region take birth primarily for a spiritual mission such as participating extensively in satseva towards the establishment of the Divine Kingdom and in the process augmenting their own spiritual practice and growth. 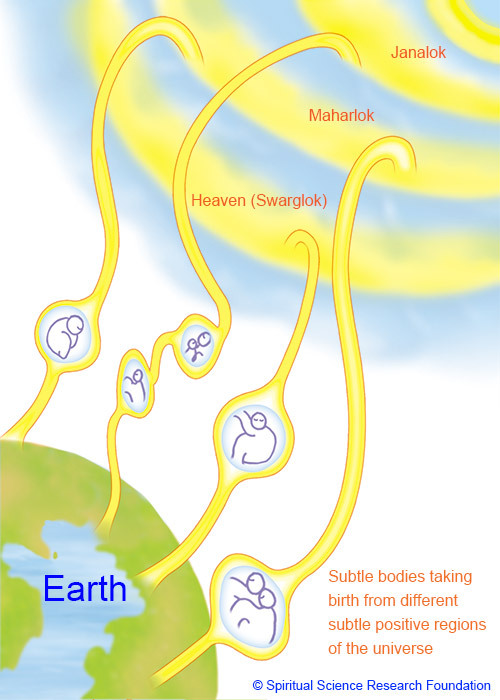 Janalok and Tapolok (the 5th and 6th positive regions of the universe): These evolved subtle bodies take birth on the Earth plane of existence as per God’s wish. They work for the establishment of the Divine Kingdom and to protect seekers from Raja-Tama (spiritual impurity prevalent in society). This destiny is mainly associated with collective destiny. Refer to our blog on collective destiny. Since they have a body, this is destiny associated with the physical body. Due to taking birth on Earth, a negative covering may come over them as they descend from a higher plane to a lower plane of existence. 30% is the maximum ego of an average person in the current era (Kaliyug). However, some evil people on Earth such as corrupt/evil politicians and leaders, terrorists, etc. can have egos of 40% and above. Mainly in the form of vital energy. Refer to our article – What are we comprised of? People emitting negative vibrations purely due to negative energies. A visual part of our spiritual research is knowledge gained by seekers through an advanced sixth sense of vision. These seekers are able to see the spiritual dimension and they present their findings in the form of drawings and text. Given below are drawings by H.H. Yoya Vallee, which predict how these Divine subtle bodies take birth together for participating in God’s mission. Divine children have been coming in batches for many eras to help spiritually uplift humanity and guide them towards a spiritual path and finally spiritual enlightenment. Due to the presence of such Divine children, there is an immeasurable positive spiritual impact on the surrounding environment. Due to the Sattva predominant vibrations emitted from them, the environment is purified continuously at a spiritual level. Their sub-conscious mind is absorbed in doing spiritual practice, so such thoughts permeate the environment wherever they go. When they laugh the environment is purified due to the particles of Bliss which are emitted into the environment through their laughter. Due to their presence, the negativity or attacks by negative energies are destroyed. Our body gets spiritually purified by remaining in their presence. Due to their Holy company or satsang, humankind will get a lot of spiritual benefit. Such children only speak at a spiritual level. Accordingly, when average people hear them, their worldly thoughts and emotions reduce and/or are nullified and they are also able to remain at a spiritual level. Due to the satsang of Divine children, our intellect gets convinced that we have to do spiritual practice and get liberated from the cycle of birth and death. Our faith in God is reinforced through their influence and example. They have leadership qualities and therefore they automatically take responsibility for other’s well-being and encourage them towards spiritual practice.